President Yoweri Museveni inspects a guard of honour on his arrival at Maputo International Airport on May 17, 2018. On the right is Mozambique's Foreign Affairs Minister Jose Pacheco. Maputo — President Yoweri Museveni has arrived in Maputo, the capital of Mozambique, for a three-day state visit on the invitation of his counterpart, Filipe Jacinto Nyusi. On arrival at Maputo International Airport Thursday afternoon, President Museveni was received by the Mozambique Foreign Affairs Minister, Jose Pacheco, the Agriculture Minister, Higini Marrule and a host of other senior government officials. The President was given a red carpet reception and inspected a guard of honour mounted by the Mozambique Armed Forces. He was also treated to entertainment by several cultural troupes. 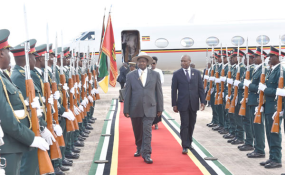 From the airport, President Museveni's entourage moved to the Presidency where he was received by his host, President Nyusi and also treated to a 21-gun salute before both leaders led their delegations into bilateral discussions. After the talks, Uganda's Foreign Affairs Minister, Mr. Sam Kutesa and Mr. Pacheco signed a general cooperation agreement which will see both countries cooperate in areas of defence, tourism, diplomacy and trade. Both Presidents witnessed the signing. A Joint Ministerial Commission will meet in Kampala in August this year to concretize this agreement. Currently, Uganda exports goods and services to Mozambique worth $154,000 while Mozambique's exports to Uganda stand at $5.12 million. These are mainly sea food, cashew nuts, sugar and coal. Uganda has export potential in areas of maize, beans, timber, fruits, beef, and coffee. President Museveni is set to address the Maputo Municipal Council later this evening where he is slated to be accorded the highest recognition. Tomorrow, Friday, President Museveni will visit the Mozambique National Assembly, visit the Heroes' Memorial Square, as well as the military club where he will meet former leaders of the Mozambique liberation struggle. Later, President Museveni will visit Pemba City in the province of Cabo Delgado and Montepuez Barracks where fighters of the Front for National Salvation (FRONASA) that he led in the 1970s, underwent their first military training. The President will be accompanied by three of the remaining survivors from the group of 28 freedom fighters he led to Mozambique. They are Gen Caleb Akandwanaho aka Salim Saleh, Lt Gen Ivan Koreta and Col Bosco Omule. The rest of the Ugandan delegation includes Minister Kutesa, Col Bright Rwamirama, the Veteran Affairs Minister, Maj Gen Proscovia Nalweyiso, the Senior Presidential Adviser on Security and Ambassador Richard Kabonero.